Said Akl, A Legend from Lebanon Lebanese poet, philosopher, and linguist Said Akl died at 102. Akl wrote numerous poems, songs, play scripts, and literature work in Arabic, French, and Lebanese. He took pride in his writings about Lebanon since the ancient times, during the war, and post-war. He had a unique and straight forward personality in all aspects from literature to politics and his title was the teacher. 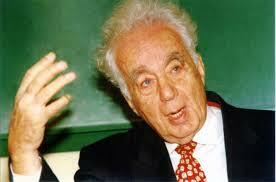 He was the top author in Arabic language of his time, and also the best writer and promoter of the Lebanese language. His support to the Palestinians as a nation was clear in his writing and poetry, yet his opposition to Palestinian terrorists acts in Lebanon was also clear. Said Akl was buried in his hometown of Zahle on December 2, 2014. The Lebanese Language Institute extend its condolences to the people of Lebanon, the Middle East, and to all the generations that enjoy his work. Saxiid Xa`il, Iṡṫura min Libnen Met Saxiid Xa`il, ketib w cexir w faylasuf Libnen w ken ximro 102. Xa`il katab ktiir acxaar w aġene w masraḣiyyet bil Xarabe wil Frensewe wil Libnene. Ken xindo faḱir ktiir bi kill kitebeto xan Libnen tteriiḱ w Libnen l ḣarib, w Libnen baxid l ḣarib. Caḱṡiito kenet ktiir ṡariiḣa min kill nnaweḣe min l adab la ssiyese w ken la`abo l mxallim. Ken ahamma ketib bi lliġa l Xarabiyye wib zet wa`it ahamma ketib w mucajjix lal liġa Libneniyye. Ken max ccaxib l Falasṫiine w katablo acxaar w aġene bass kamen wi`if ḋiḋ l irheb yalle ximlito miliicya Falaṡtiiniyye bi Libnen. Saxiid Xa`il ndafan bi ḋayixto Zaḣle bi 2 Kenun l Awwal 2014. Maxhad L Liġa L Libneniyye biixazze l Libneniyye w kill ccari` w kill l ajyel yalle bitḣibb axmelo.